Two weeks until I return to school to start my second year of graduate school - I'm stunned that time continues to slip away. As I scramble to finish the multitude of projects that I slated myself to finish this summer and chide myself for not getting more done, I have to reflect on what I actually DID do this summer. To be fair to myself, I accomplished a lot! I managed to pull together an early (and much needed) summer vacation to Massachusetts, Rhode Island, and New York with my daughter to visit my partner in Cape Cod in May - we relaxed on the coast, enjoyed an encaustic symposium in Provincetown, went to NYC to see Heavenly Bodies at The Cloisters and The Met proper, visited the MFA-Boston, Salem, Sienna Patti, checked out Anselm Kiefer's new show at MassMoca, saw old friends in PVD, and visited my most beloved aunt in Oakham. It was my daughter's first time seeing the ocean and it was a trip we will never forget. Upon returning, it was time to work. In addition to teaching and making this summer, I was awarded a small grant for research late in the Spring semester, so I used the funds to travel north to the upper Michigan peninsula for field work. I spent the weekend studying the material culture of the Finnish and mining cultures of the region, visiting museums, sweating it out in saunas, and eating pasties along the way. On my last day, I joined up with a group of UW-Madison Folklore students also researching in the area, and we attended the annual Juhannus festival. There was Finnish food, dancing, beer, and a spectacular Midsummer bonfire in Toivola. 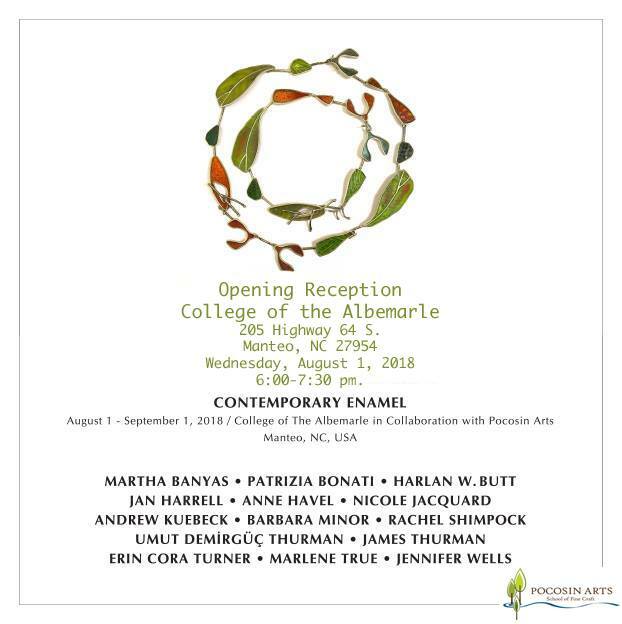 Finally, my fellow grad Chloe Darke and myself were awarded scholarships to attend a workshop at Pocosin Arts School of Fine Craft in North Carolina. For a week we refined our smithing skills alongside Maia Leppo creating steel jewelry pieces and samples. We also enjoyed the swamp and its resident spiders, ate lots of Peruvian and Mexican chow, saw amazing enamel work, and visited the local junk shops (where I found an amazing antique steel greyhound muzzle, which I kept on my bench throughout the class). There may have been a trip to the outer banks for some legitimate beach time as well . . . On our last day, we drove to Norfolk, VA and visited my buddy Jane Ritchie, who took us for to superb sushi and local brews. The utmost of thanks to Pocosin for gifting us the time and space to work, as well as all the new connections. It really has been a summer to remember.